Yes, so that is 9.1 Petabyte of data written! Good lord. The German colleagues from c't (print magazine) have ended their SSD endurance tests after the last SSD decided to go belly up. That last SSD of the survivors was the Samsung 850 Pro, and it had written an astounding 9100 TB of data, yep 9,100,000 Gigabytes. That particular SSD is rated for 150 TB written and now is three years old. c't used six SSDs of each model: OCZ TR150, Crucial BX 200, Samsung 750 Evo, Samsung 850 Pro, SanDisk Extreme Pro and SanDisk Ultra II. Conclusive was the fact that all SSDs lasted way longer then advertised. The two SSDs that failed first where a Crucial BX200 , which lasted twice the number of advertised writes at 187 and 280 TB. Then also a number of SSDs died after a accident that caused a power surge or peak (could not understand it really well as the original article is written in German). The top batch became the SanDisk Extreme Pro and Samsung 850 Pro models, they all lasted a minimum of 2.2 Petabyte. A normal office system writes between 10 and 35 GB per day. Even if you had a generous 40 GB per day, a nominal endurance of 70 TBW would be achieved after five years. Now if we extrapolate that data and take it to the Samsung SSD 850 that would be 60 times the guaranteed write performance of 150 TBW. At that average of 40-gigabyte daily usage, (purely theoretical of course) that SSD would have lasted 623 years. No matter what this articles indicates, Guru3D recommend you to always backup your data. That is 35546 full drive writes. Abso-freekin-lutely amazing, those MLC flash cells are rated for 3000-5000 rewrites, yet they lasted ~35000 times !! SSD's are very much the future of storage, i would like to see a mechanical hard drive last that long, as long as they aren't DOA i don't really see SSD's dying and the newer ones can last even longer with their higher write and read counts... it's very impressive to say the least! SSD tech is the future. With 64 and 128 layer ships coming with up to 1Tb per ship, we will have bigger SSD than HDD! 3 to 5 more years and the price/performance will make HDD die. Nice, i just bought one to replace my 840pro! I don't see them covering the NINE times price difference in the next 3-5 years. HDD's of similar capacity will drop in price as well during that time. For large data storage like 4K video ( which I do ), and in the not-so-far future maybe 6K, 8K, large HDD storage will still be the norm. But in 10 years... there's a very high chance HDD's will be history by then. That's really nice to know, I've got an 850 Pro 256GB myself At 7.3TB total written so far. Oh noes. Im already at 15TB. I have 6.4tb written to my 830 128gb, was there endureance done on the 830's? Pretty amazing drive there. Intel SSD's go read-only when their factory set write limit is reached. I expect these companies to implement a similar practice, as it doesn't make sense business-wise to make a product that could last 600 years. As i posted "before", almost all data center/large storage info shows ssd's dying because of age, not written data (to chip). after 3y about 25% of the drives had failing chips and lost and/or corrupted data. main reason i start replacing my drives after 2y of use (no matter the writes on it). Keep in mind, even if you're in the "generous 40GB of writes per day", the larger your drive is, the longer it'll live (SSDs try to balance their write load). I figure the advertised lifespan is probably to prevent lawsuits due to poor operation conditions. In other words, if you run your SSD in 90C ambient temperature and have it re-write to the exact same cell as fast as it possibly can, I'm sure that cell will probably fail in their advertised time. Yep. You don't have anything to worry about. Search for Xtremesystems SSD endurance test, go to first page an scroll down first post a bit until you find a bar graph with a huge red bar. Yep, that's the Samsung 830, running for x6 it's advertised writes. I remember I was somewhat preoccupied when I bought the Samsung 830 128gb SSD in November 2011 when almost everybody was circlejerking around SSDs life and writes block and read only and HDDs for life(holy mollies, almost 6 years), but then, after following this thread for some weeks, wich was the first SSD Endurance test EVER, all worries went out. Summing up, Samsung 830s are as good as x6 adversited writes in that test. 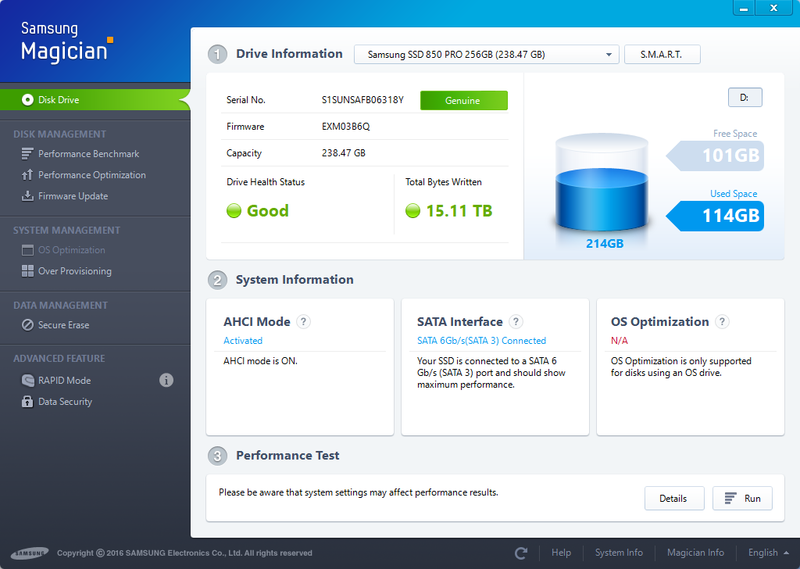 And then after they started using EVO and Pro with different specs(830 series were only 830), the Samsung Pros are pretty much the most reliable and fast consumer SSDs series after series. I still have it and the only thing that will make part with it will be a Samsung 950 Pro Nvme in 256 gb format which I'm currently eyeing. On my Samsung 850 Pro (256 GB) there are around 2.3 TB of data written. Really fast SSD, works great.